Happy June everybody! It's crunch time around the old nest...T minus 1 month to moving day. Now's when I start to get all jittery and my eye starts to twitch and the family knows that when they see that crazed look on my face, it's better to just smile and leave the room. Ha ha! 1. Start Early. If you have the luxury of knowing a while in advance when you will be moving, don't procrastinate. Giving yourself plenty of time to declutter and pack is THE KEY to sanity while moving. 3. Make sure that you pack items separately that you will need upon arrival at your new house, and then make sure you keep them with you (in your car for example). For instance, make sure you have some clothing, personal hygiene items including toilet paper, cleaning supplies, important papers, bedding, etc. available when you arrive so that you aren't ransacking the house trying to find where you packed the toothpaste. In addition, make sure that you set up beds first thing when you arrive at your new place. It's always nice to have a bed to sleep in when you're surrounded by boxes. 4. Make all necessary arrangements for utilities, mail changes, and kids' schooling as soon as possible. Nothing like showing up at your new place and having no power. And little people transition easier when Mom and Dad already have things arranged at their new school. 5. Find Free Boxes. This is always an issue for us. We ALWAYS move ourselves. And we have rarely had enough room to store moving boxes from previous moves, so we always find ourselves in need of moving boxes. But here's a great tip on how to get FREE moving boxes. Look on Craig's List or on your local on-line classified ads in the Free Section. You will almost always find someone who is trying to get rid of moving boxes. 6. Purge Before You Pack. This might not save you time while you're packing, but it will definitely be worth it once you arrive at your new place. I hate to admit it, but there are boxes in my basement right now that the Hubby and I have lugged from place to place for at least the last 10 years. And here's a hint..if we haven't needed the stuff in 10 years..we're not going to need it. So this move, we're getting rid of the stuff before we move it one more time. 7. Breathe. If all else fails, just remember, this too shall pass. When I get stressed out, I just visualize myself in my new space...with everything put away, and I realize that in a few short weeks, all the chaos will be over, and I'll have a new place to decorate. And that just puts a smile on my face. 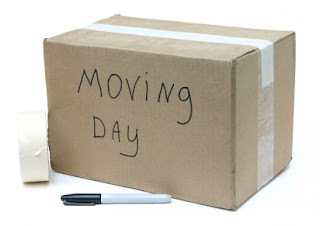 If you're moving, or just thinking about moving, I hope you'll be able to use some of these tips to help you stay sane in the process. Excellent advice. When I moved 3 yr ago, I did all these things. But ya know, invariably the remote goes missing anyway!! We are right there with you in moving land. 3rd move in 12 months - yikes!! We definitely need to do a better job with the pre-move purge this time around. Breathe is the most important of all!! Starting early and free boxes are great tips! And enlist many helpers!! A great place to get boxes is the ABC store. The boxes are heavy duty to support the glass bottles and also have awesome dividers that work great for packing up your kitchen! Oh, I feel for you - I hate moving! We've moved twice since we've been married. We moved in 2006 and I swore I'd never move again - we moved our huge Rainbow swingset, too! We used the PODS and it was wonderful loading up the POD with all the non-important stuff first and then sending it away. We loaded 3 PODS total and I scheduled them to arrive on our moving day within an hour of each other. We had 30 friends show up to help move and they would empty one in ten minutes! It was crazy cause they'd wait around for an hour for the next one. Well, it worked great. We had the kids stay at my parent's house and so I got the kids rooms set up first so their first night was in a mostly set up room. I'm crazy and can't stand being in boxes, so I was totally unpacked and set up in 2 days! It will be worth it, but certainly is stressful. Good luck! I have been fortunate to have my hubby's company pay for the packing and moving BUT it was still really stressful having someone else pack your stuff. I followed them around requesting like things be packed with like things and to label if something was not in the "right" box! We are renting and we know we will have to move one day, but after mooching 10 times in our 20 year marriage we are in no hurry to move again! I feel your pain, I am T-minus 7 days until our move out date! I do agree with you first tip, start early! I took advantage of that and started clearing out stuff to sale at rammage sale or give away! No point in packing clothes we haven't wore in years. LOL. Good luck with the rest of the packing! Thanks for the positive words... "Breathe" is what I keep forgetting to do! We are a military family in the middle of our 5th move, and I can testify that it really does not ever get easier! I took a break from sorting piles to sit down and read some blogs... and found your post! Thanks for this post!! My fam and I are moving across the country in 2 months and this will help!!! Moving out is frequently accompanied by panic! However, everything can be done with the right tuning. Just tell yourself you can do it. We just moved last month and I lucked out. I have friends who own a restaurant and a friend who runs the cafeteria in the public schools. They all gave me boxes. We had more boxes than we could possibly use thanks to them. The one who worked in the schools lived near me, so she even delivered tons of boxes boxes to my front door. I just asked for boxes on Facebook and I was amazed at how many friends worked in jobs and buildings that had plenty to spare.